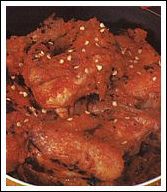 Hot Chicken with chilies is one of the traditional Indonesian spicy fried chicken recipe. We use a lot of chilies in this chicken recipe. You can bake the chicken or grill it. But the most important of the recipe is the paste, there is the key. The better you make the paste, the better its taste. I see in Europe especially in Holland that this recipe uses to complete the rice table (“rijst tafel”in Dutch), it’s very famous there. By the way, it’s very easy to make. It’s not very complicated; I put it as simple as I can. So, try it, and don’t give up. Cook with Passion and Love. You would be amazed by the end results. Everybody cook different and so are you, the same recipe doesn’t have to be the same end result. The most important is that the recipe is made to your taste. Make a spice paste of shallots, garlic, red chilies, sugar and salt. Quarter the chicken. First rub them with vinegar or lime juice and then wash with clean water. Baked the chicken in heat oil until they have golden brown color. Or if you like grilled chicken, put them in the oven until the chicken is tender and have the golden brown color. Remove and set aside. Heat the oil in the wok and fry the paste until fragrant. Add the chicken and stir it around to distribute the flavors evenly. Add the ginger and tomatoes. Pour some water in to the wok and let them boil until the sauce completely reduce. Taste it and if needed add sugar and salt.